What’s left to say about Tom Douglas, the wizard of Seattle whose restaurants pop up as reliably and frequently as bouquets from a magician’s hat, and who already has 12 storied venues throughout the city—places like Dahlia Lounge and Bakery, Lola and Palace Kitchen? As it turns out, plenty. Douglas opened his 13th restaurant in Seattle, The Carlile Room, in July of this year with a characteristic flourish and a bunch of well-deserved accolades. The restaurant is apparently named after his fave singer-Seattleite Brandi Carlile, although her alternative-country style has no discernible connection to the bass-heavy background music featured here. The theme this time around is “circa 1972,” evidenced in the décor of vinyl booths and sputnik chandeliers, the lounge-lizard cocktails (Manhattans, Mai-Tais, Tom Collinses, and Brandi [get it?] Alexanders), as well as a lineup of DJs spinning records that span a couple of decades from mid-century rock and soul to British Invasion to ’60s garage and early-’70s funk. The vibe is retro, lively and very loud. The cuisine, on the other hand, is anything but nostalgic. Fresh and contemporary, it’s several generations removed from the meat-centric ’60s. In fact, this self-styled “plant house” is a steak house in reverse: it’s local-veggie-intensive, foregrounding a list of “Plant” dishes meant to be paired with an item from the “Carne Diem” selection of salmon, pork, beef and chicken. As it’s just across the street from the Paramount Theatre, where Douglas also happens to do the concessions and owns a few seats, the room caters to pre-theater and late-night crowds: it has a hearty bar menu of sharable plates and sensibly offers side-dish portions of its main courses so diners can pick and choose from all over the menu. The extensive wine list is among the most impressive of the Douglas empire, stocked with some rare “Limited Edition Wines” but also deep in affordable choices from Europe and the Northwest. You won’t have any problem finding brisk, mineral-driven whites or energetic reds on the list, often from cult producers. Much of the produce featured here comes from Prosser Farm, owned by Douglas and his wife and business partner Jackie Cross—according to Douglas, the most expensive thing he’s doing in the restaurant business is growing vegetables. The results more than repay the effort: bright beet greens, baby rainbow chard, tender lettuces and radishes, and prize-worthy heirloom tomatoes, peppers and eggplants—all shown to advantage in preparations that emphasize intensity of flavor with a minimum of fuss. Witness the success of starters like red and green heirloom tomatoes dressed with smoked corn, or sautéed Padrón peppers served under a silky blanket of Gruyère. Our table clashed forks over the remains of a roasted cauliflower unexpectedly infused with lobster stock and coriander and spiked with a dash of chili oil. 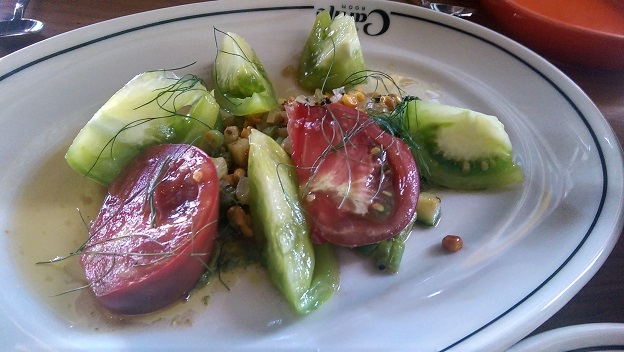 The 2013 Zarate Albariño, reportedly from one of the first truly organic growers in the Rías Baixas, took the veggie starters to another level. With its aromas and flavors of sea breeze, lime blossom and fresh herbs; its tactile, extract-rich salinity; and its dusty length, the Albariño was a lovely match for the caramelized crunch of the cauliflower and the smokiness of the tomato-corn dish. And its saline minerality elevated the lobster stock in the heirloom tomatoes and smoked corn dish. The same inventiveness in the kitchen transformed simple meat dishes like moist rotisserie chicken with cherries, mint and basil, pork shoulder with chorizo, and pepper pot—a peppery cioppino of fish, shellfish and corn. 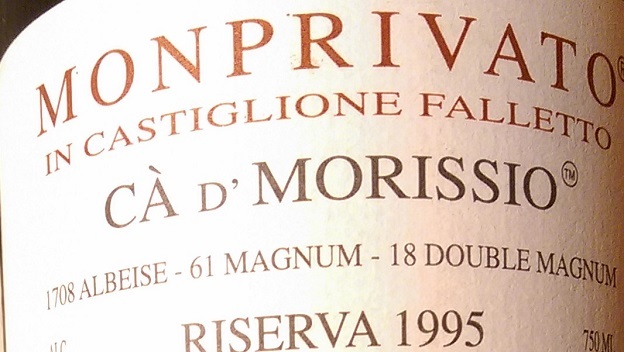 Our bottle of the 1995 Mascarello Barolo Riserva Monprivato Ca’ d’ Morissio, which I had carried from New York, was still in ascendance at age 20, offering a deep, bright red color with a hint of amber and seductive aromas of cherry, rose petal and leather. Its penetrating acidity and subtle smoky character sliced through the meltingly rich pork shoulder, bringing out the sweetness of the meat and the pungent spice of the sausage. Virtually all the desserts here offer a touch of restraint, with savory or citrus notes playing off sweet, but I’m ashamed to admit that we had to abstain on account of we were stuffed. How does Douglas manage to come up with so many winners in this town? Diners here are adventuresome and dedicated locavores, but they're not willing to pay for smoke or hype. Sure, Douglas has a gimmick for each new venue, but the crucial success factor is that his menus consistently deliver value at realistic price points.